7 Local Hawker Dishes That Epitomise The Term "Wok Hei"
If you are a Singaporean, let alone Chinese, and you still don’t know what the term “wok hei” refers to, then you need to buckle up and read this article because you are missing out on some very important information. In Chinese, the term wok hei translates to, “breath of the wok”, which might sound dramatic (as all Chinese sayings are) but is actually very true with regards to Chinese cooking. This “breath of the wok” refers to the taste and flavours that are imparted by a hot seasoned wok on food during frying. An art form that is only possible through the careful manipulation of time, fire and skill, wok hei imparts a complex, smoky flavour that occurs only when fresh ingredients are cooked over extreme heat. Every hawker’s dream is to perfect the art of wok hei. This art of achieving the perfect wok hei, however, takes years of hard work and dedication, not only in honing one’s skill but the seasoning and conditioning of the wok as well. To get a taste of what wok hei actually is, we have here a list of 7 local dishes that we feel are the definition of wok hei. Carrot cake is a must-have on this list. It comes in black and white and is always fried to perfection in a giant wok. For the white version, it is usually crispy on the outside and nicely charred after being fried, giving it a nice, slight wok hei taste and aroma. For its blacker, sweeter counterpart, it is usually coated in delicious, sweet black sauce which caramelizes, enhancing the wok hei flavour more when fried. We love this plate of goodness from Ghim Moh Carrot Cake Stall, and we feel that they have perfected the art of cooking carrot cake with a great wok hei taste. For their black carrot cake, they tend to fry it into small, crispier bits which enhances the overall smokiness and wok hei taste. Char Kway Teow is a classic local favourite that we all know and love. Who can resist a plate of chunky rice noodles tossed with fishcakes, eggs, vegetables, Chinese sausage and prawns fried till wok hei perfection in that delicious dark sweet and savoury sauce? We love Dong Ji’s Fried Char Kway Teow, which is the perfect mix of sweet and savoury. However, the most important bit that has gotten us hooked is its intense wok hei aroma. From the perfect char on the edge of the rice noodles, you can immediately tell that you’re in for a smoky, delicious treat. Everyone loves a good, comforting plate of fried bee hoon, and it can be eaten for breakfast, lunch, dinner or even supper. This simple dish of bee hoon and a mix of sauces and ingredients tossed together in a wok makes for a great, filling meal, and we love how the wok hei flavours really stand out and complete the dish. One of our favourite places to get some solid bee hoon is Joo Seng Road Food Place. Their seafood bee hoon is generously served with a large portion of seafood as well as cabbage for that extra crunch. Best of all, they know how to cook the bee hoon here till perfection, and you get to savour that delicious wok hei goodness in every bite. Who can resist a steaming plate of deliciously fried egg omelette? We definitely can’t! A fried omelette is a popular centrepiece dish that people love to share alongside other dishes. We love how you can toss just about anything to an omelette to create new textures and flavours. 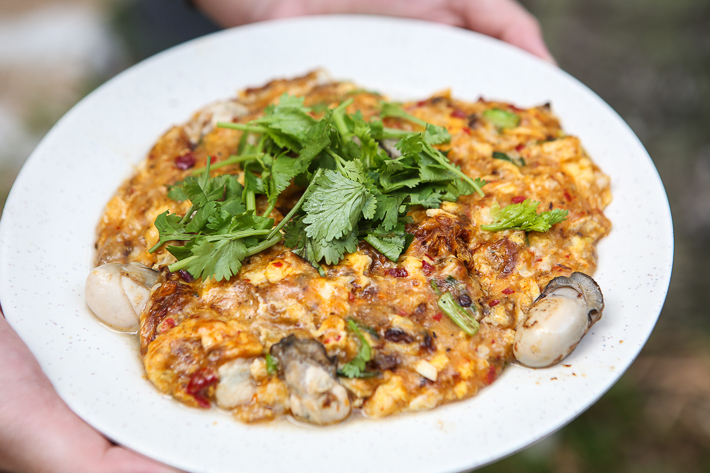 Fry it up wok hei style and you get yourself a really delicious, aromatic omelette. We absolutely love the oyster omelette at Hock Kee Fried Oyster at Serangoon Gardens Market & Food Centre. They mix in a generous amount of plump, briny oysters into the egg, and it’s fried till you get that smokey wok hei perfection. For an extra kick, you can dip it into their tangy chinchalok sauce! And unlike many other stalls that sell it, they are perhaps one of the rare few that still does the traditional wetter version. One of the first dishes that comes to peoples minds when you mention wok hei is fried rice. A good plate of fried rice is not complete unless it has that wok hei taste to it. We love biting into the slightly charred bits of ingredients and rice, and it makes us feel like we are discovering little nuggets of joy. One fried rice that we highly recommend is the one at Joo Seng Road Food Place. It was one of our favourite dishes there, and it comes in substantial portions so you can get enough of that wok hei goodness. They are also really generous with the amount of seafood they have mixed into the rice, so this dish is really one where you can get your money’s worth. A classic all-time favourite that Singaporeans flock to at hawker centres. Who knew that a simple plate of rice vermicelli, yellow noodles, prawns, squids and eggs fried together in a giant wok could produce such an intense, mouthwatering wok hei flavour? Nam Sing Hokkien Mee sells one of the best Hokkien mee around and is worth the long, snaking queue. There is a reason why this place is so popular – Their noodles have soaked up all that rich, delicious broth, and every mouthful of this goodness encompasses a strong taste of wok hei, leaving us craving for more. Another classic favourite will have to be hor fun. Hor fun comes in many different forms, but they are similar in that they are not complete unless they have that distinct wok hei taste. One of our favourite hor funs has to be the Holland Village San Lao Hor Fun, which is a simple but satisfying dish of hor fun, thick slices of fish as well as a copious amount of bean sprouts. What completes the dish was the smoky wok hei flavor that really puts everything together. If you’re craving for some good hor fun, this is the place to go.